"I've heard you should have a connection with your subject," writes Francine Kunkel. 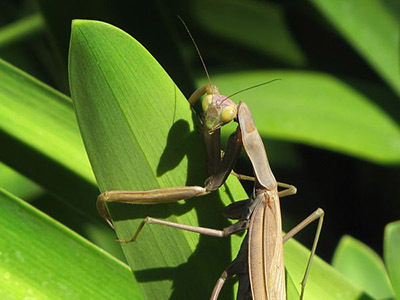 "Well that certainly was the case with this praying mantis in my garden. His little head and big eyes followed my movements as I bent and knelt to get the right angle. I almost expected him to smile." Francine captured this garden portrait with a Canon PowerShot SX10 IS at 1/250 with an aperture of 5.0, and ISO set to 80.